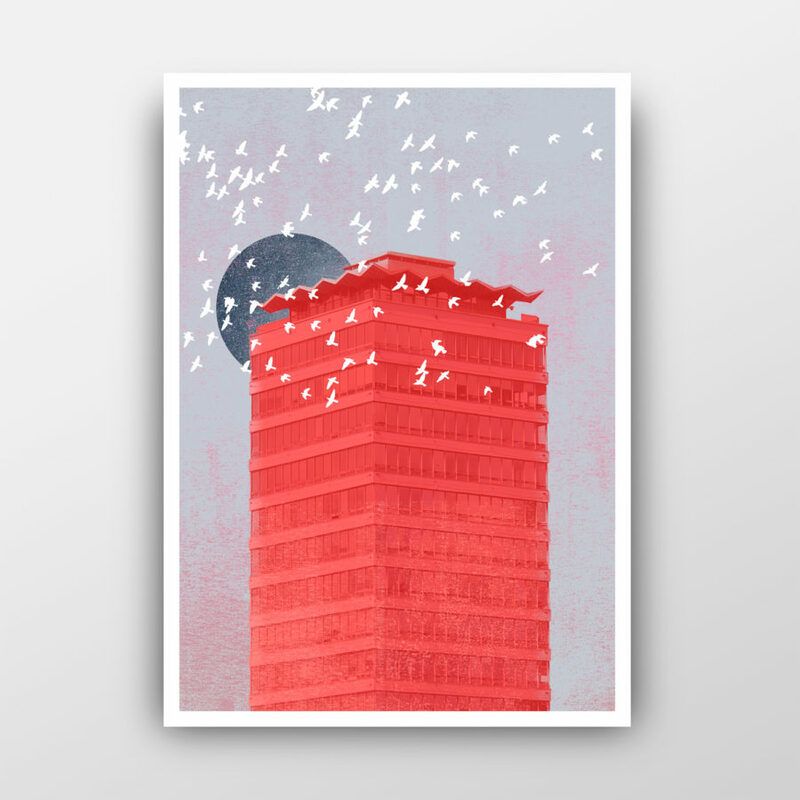 Modern art print of Dublin’s Liberty Hall. Considered to by many to be an open wound on the Dublin skyline this archival print of Liberty Hall by Jando Design seeks to reconnect the dots on the streets below this “demonic” brutalist structure. Printed on beautiful 189 gsm archival matte paper with archival inks and guaranteed to last for over 100 years. 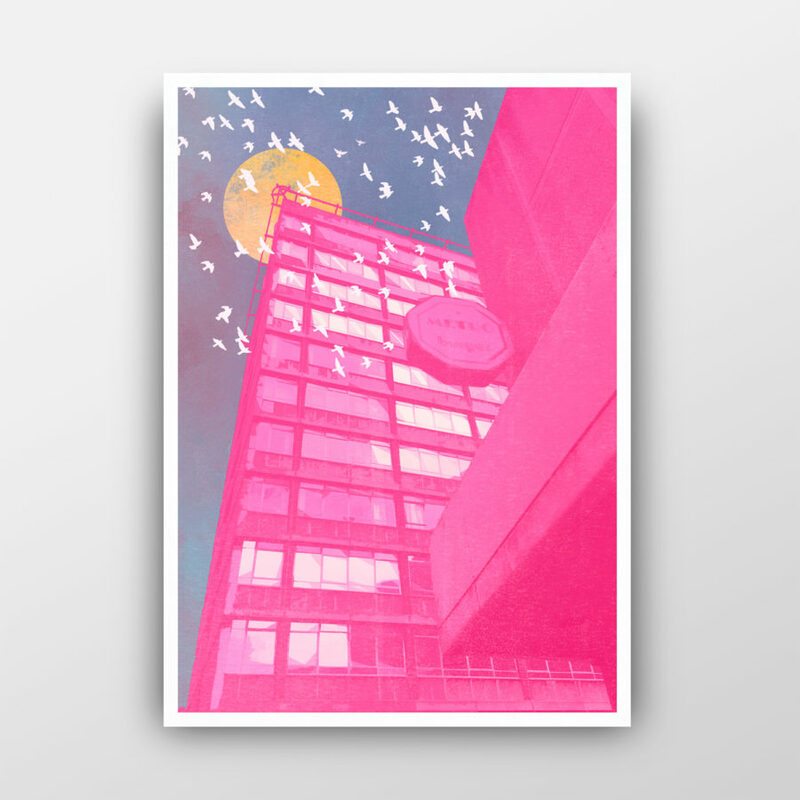 Modern art print of Dublin’s Hawkins House. Built in 1962 and tucked away off the quays lies the much maligned Hawkins House. On many occasion voted “Dublin’s Ugliest Building” this curious mesh of concrete and steel looks like its been transported from a JG Ballard novel or from post Soviet Russia. Printed on beautiful 189 gsm archival matte paper with archival inks and guaranteed to last for over 100 years. Jando Design create a unique range of colourful and contemporary prints and greeting cards. Based in their studio on the banks of the River Liffey in Dublin, husband and wife team Julie and Owen McLoughlin design, create and package their entire range using high quality recycled paper and eco-friendly packaging. Their hugely popular range of architectural inspired prints celebrate and seek to recontextualise Ireland’s contrasting types of architecture. Defined by eye catching and vivid inks, their distinctive body of work is both exciting and modern, with a strong emphasis placed on kineticism and the playful use of colour.